Web pages, as we know them today, are often stuffed with resources—such as images, text, fonts, etc.—which make them much heavier than those of the 1990s or even 2000s. Accordingly, it takes more time for them to load, so web designers and developers have come up with nifty workarounds to duck the issue. Still, it has become obvious that there's a need for an update to the HTTP protocol itself. To fetch the web page you'd like to visit, your browser communicates with the server. They interchange messages—the browser requesting the images, fonts and other resources needed with separate requests, and the server, in its turn, sending them as responses. Your browser will still send requests to a server and get responses with the assets needed for the web page to look as it should, but some nuances in between will change. HTTP/2 brings new features such as multiplexed streams, server push, header compression and binary format—each of which I'll examine in turn. Remember the congestions caused by many connections passing the resources such as text, fonts and pictures from the server to your browser? Multiplexing eliminates this problem by making those assets into smaller parts, passing them all via one connection, and then reassembling the resources after they've reached the final destination, the browser. HTTP/2 is more proactive in this regard, sending assets that the browser is likely to need without it having to ask. These assets go to the browser's cache, and are available immediately if and when they're needed, which is a plus for performance. The textual format has some extra overhead and needs to be refined, while the binary one does not need any parsing. It's also a lot more compact. Additional work of a server means additional time to wait for the web page to be loaded. That is why the binary format, with its being easier to process, is a justified enhancement. Though it's not required by the actual HTTP/2 specification, most browsers supporting HTTP/2 will require HTTPS encryption. This means that, if your HTTP/2 site is not served over an encrypted connection, visitors will either have to find some other client to visit your site or miss out. The web will transition painlessly for the public. The modifications and upgrades needed for the new version of the protocol to work will take place in servers and browsers. Servers will be updated over time to eventually support both protocols. Browsers supporting the new protocol will switch to HTTP/2 automatically. At the same time, the older ones will not understand it. As a developer, you'll need to know whether both your browser and the server you are using support HTTP/2 to ensure the connection will be upgraded to it. If you'd like to have a more profound look at how differently data is loaded through the connections in the protocols, check out this golang.org example. It lets you try different latency settings, so that you can see how data would be loaded concurrently on devices of different capacity. 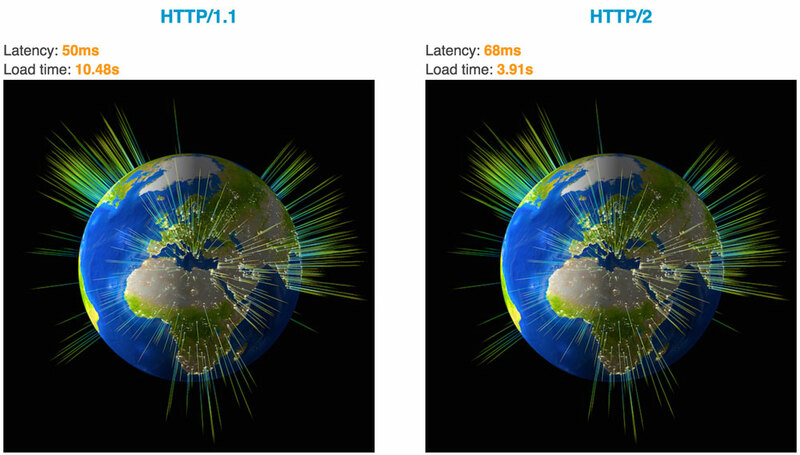 The longer the delay, the more visible it is that HTTP/2 wins in terms of performance. Lexy Mayko is passionate about everything connected with APIs. She's a perfectionist, British humour enthusiast, literature and history geek, and a member of the API2Cart team.